".... two and a half miles east of Ryde, is a village which has grown into an important and popular sea-side resort during the past twenty years. The approach by the sea wall route is particularly charming, and Sea View is now an important resort for visitors. 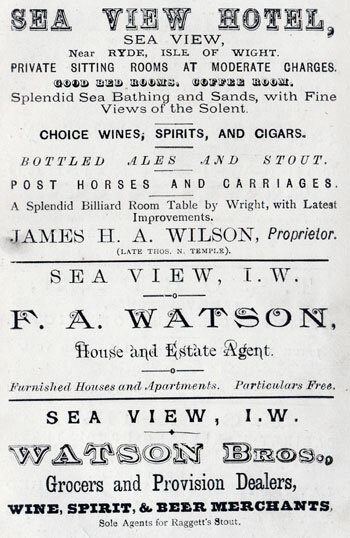 Some fine houses have been erected, with a spacious hotel, and a noble iron suspension pier, to which there is a regular steamboat service, the steamer calling there en route between Bembridge and Portsmouth. The pier was erected in 1880-81, and is 1,000 feet in length, with a further extension in the form of a pier-head 50 feet long. It commands charming views east and west, with a delightful panorama of the Hants and Sussex coasts. And the shore is almost unrivalled for natural loveliness, while the fine, soft sands of the beach make it a specially charming bathing ground. The Church, or rather proprietary chapel, was erected in 1850 by subscriptions; it was built of stone in the Gothic style, and consists of nave of four bays, and north porch and aisle. It is capable of accommodating 300 worshippers. There are also Wesleyan and Methodist Free Church places of worship in the village. Visitors can find splendid accommodation at Sea View Hotel (Mr J. N. Wilson’s), or private apartments and well furnished houses to be had through Watson Brothers, House Agents.